French banker and writer; born at Bordeaux in 1812; died at Paris 1898. He was a son of Isaac Rodrigues-Henriques, head of a great banking-house in Bordeaux. 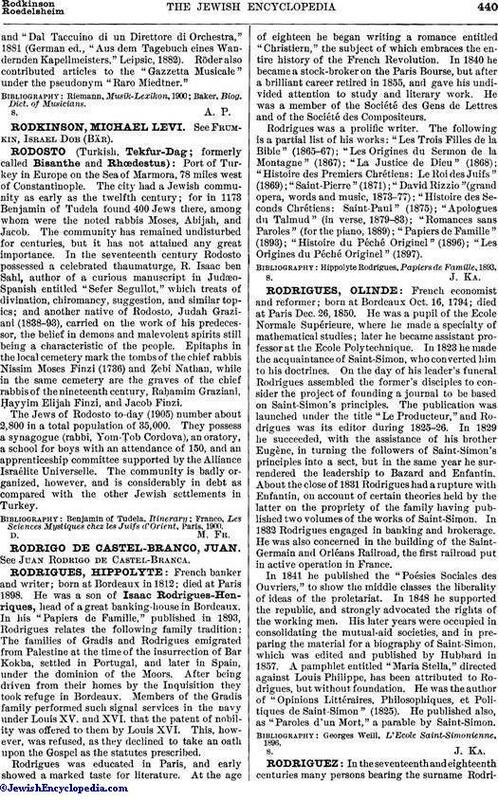 In his "Papiers de Famille," published in 1893, Rodrigues relates the following family tradition: The families of Gradis and Rodrigues emigrated from Palestine at the time of the insurrection of Bar Kokba, settled in Portugal, and later in Spain, under the dominion of the Moors. After being driven from their homes by the Inquisition they took refuge in Bordeaux. Members of the Gradis family performed such signal services in the navy under Louis XV. and XVI. that the patent of nobility was offered to them by Louis XVI. This, however, was refused, as they declined to take an oath upon the Gospel as the statutes prescribed. Rodrigues was educated in Paris, and early showed a marked taste for literature. At the age of eighteen he began writing a romance entitled "Christiern," the subject of which embraces the entire history of the French Revolution. In 1840 he became a stock-broker on the Paris Bourse, but after a brilliant career retired in 1855, and gave his undivided attention to study and literary work. He was a member of the Société des Gens de Lettres and of the Société des Compositeurs. Rodrigues was a prolific writer. The following is a partial list of his works: "Les Trois Filles de la Bible" (1865-67); "Les Origines du Sermon de la Montagne" (1867); "La Justice de Dieu" (1868); "Histoire des Premiers Chrétiens: Le Roi des Juifs" (1869); "Saint-Pierre" (1871); "David Rizzio" (grand opera, words and music, 1873-77); "Histoire des Seconds Chrétiens: Saint-Paul" (1875); "Apologues du Talmud" (in verse, 1879-83); "Romances sans Paroles" (for the piano, 1889); "Papiers de Famille" (1893); "Histoire du Péché Originel" (1896); "Les Origines du Péché Originel" (1897). Hippolyte Rodrigues, Papiers de Famille, 1893.